When one thinks of Jimi Jamison the most common link that immediately comes up is Survivor. Jimi has been a big part of Survivor ever since he joined the band in 1984. Right from the start Jamison made a big impact as the bands first release with Jamison Vital Signs peaked at #16 on the Billboard Album Charts. More importantly it reached platinum status due to monster radio hits “I Can’t Hold Back”, “High On You” and “The Search Is Over”. Fast forward to 2012 and Jamison once again is at the helm of Survivor. He also found some time to release his latest solo album entitled Never Too Late. One listen to this disc and you will be hooked. At 61 years old, Jamison’s voice sounds just as strong today as it did two decades ago. Some of the highlights would include the title cut “Never Too Late”, “I Can’t Turn Back” and the Journeyesque “Everybody’s Got A Broken Heart”. “Not Tonight” is another song that catches your attention. Very little filler material, if any on this disc making it a no brain-er for one of the best releases from 2012. 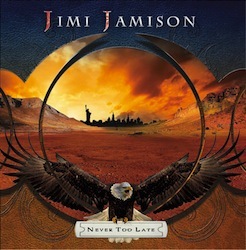 Jamison has delivered the best solo album of his career with Never Too Late. Had this been another era we very easily could have been talking at minimum three top forty singles here. But don’t take our word for it. Just give this disc a spin and you will have several of these lyrics stuck in your head for quite some time.